Defense Minister Ehud Barak toured Sderot Monday with British Foreign Minister David Miliband. 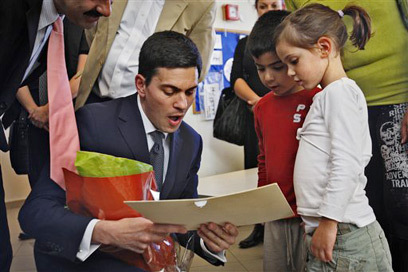 "Israel should, above all, seek to protect its own citizens," Miliband told the people of Sderot. After the tour two Qassam rockets were fired from Gaza. No injuries were reported, but damage was done to one of the greenhouses situated in Eshkol Regional Council. The Popular Resistance Committees and Islamic Jihad claimed responsibility for the attack. Barak and Miliband toured the Qassam-plagued city with Israel’s ambassador to London, Ron Prosor, British Ambassador to Israel Tom Philips, Sderot's outgoing mayor, Eli Moyal, and the city's new mayor, David Buskila. "I'm here today because Sderot has become the front line of Israel's security. It's very important that counties like mine and others show solidarity with the people of Sderot and that's what I'm doing today," Miliband said during the visit. "Israeli people need to know that the British people know of Sderot, and we know of the tragedy they are facing, and we stand with them." Barak told the people of Sderot that he had made Israel's stance on the Qassams very clear. "I told the British foreign minister that no country can accept the constant bombardment of its citizens from a foreign authority," he said. "We are responding to the Grad fire and considering our next moves. I hope it won't take too long before we can restore calm, as well as kidnapped soldier Gilad Shalit." The defense minister also addressed the closing of Gaza crossings. "The attacks in the south are coming from an entity that does not want to live in peace with us. Therefore movement at the crossings has been stopped, and if necessary we will employ force." The two ministers met with teachers and students in the city, visited the police station, and toured the border with Gaza by helicopter. Later they held a private meeting in which they discussed various political issues. See all talkbacks "Miliband: Israel must protect its own"